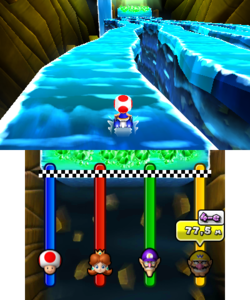 Slip Not (known as Ice Cavern Cascades in PAL versions) is a General minigame in Mario Party: Island Tour. The name of this minigame is a pun on slip knot, which has various meanings. The crystals at the end are shown. After this, the camera shows the entire course and then zooms on the player. They move for a few moments and the minigame starts. The game takes place on a cave with four cascades and the players on boards. The goal is to reach the crystals at the end of the descending course (which gets gradually narrower and more curved) by tilting the board left and right to follow the path. If a player falls from the edge, they are eliminated from the minigame. The player who gets the closest to the crystals wins the minigame. Rules – NTSC Slide as far as you can without slipping off the path. Rules – PAL "Try to get as far as you can without slipping off the course." This page was last edited on March 18, 2018, at 16:36.